From 1968 to 1973, [Jean-Luc Godard] stated repeatedly that he was working collectively. He was never tied to a party or a Maoist group, although the politics evidenced in his films seem loosely “Maoist.” For about three years he drastically reduced the technical complexity and expense of his filming, lab work, compositions, and sound mix. Partly he wanted to demonstrate that anyone could and should make films. He did not concern himself with creating a parallel distribution circuit. He said most political films were badly made, so the contemporary political filmmakers had a twofold task. They had to find new connections, new relations between sound and image. And they should use film as a blackboard on which to write analyses of socio-economic situations. Godard rejected films, especially political ones, based on feeling. People, he said, had to be led to analyze their place in history. Are not these questions still relevant today? Possibly today there are more alternative voices being committed to various media because the means of production (e.g. ultra-lightweight HD cameras and laptop editing) and the means of distribution (e.g. the Internet) make it possible to do so. However, the questions facing media producers have not significantly changed. As Godard states, making a film “in the name of…” comes with a host of issues that, though intentions are good, may sabotage from within and without the film and its message. In the U.S. we are less likely to call filmmakers “intellectuals.” Certainly, U.S. filmmakers may not be intellectuals to the same degree (or as obviously so) as those in France once were. On the other hand, anyone who actively seeks to understand the world beyond the given and controlled ideological constructs we all inherit should be called an intellectual. Many social documentary filmmakers, it could be argued, fall into that category. There is a trap, however, for contemporary would-be revolutionaries (filmmakers or otherwise) to borrow from the past what should be left in the past. The struggles of the 1960s (the period from 1956 to 1974) are inspiring and worth studying, but today’s struggles must be dealt with directly and not through a process of memory and hagiography. Today’s issues require their own terms. On the other hand, it is worth noting that (probably) all revolutions/reformations start from a re-examination and re-interpretation of the past – in particular the primary documents of the past. On a side note, doesn’t Godard (in the interview clip above) look like a slightly crazed hipster? I mean it’s apparent he just had a double cappuccino before the interview and afterward will ride away on his fixed gear. Also, is that a red bathrobe he is wearing? Marxist morning dress? Leftist lounge wear? *From Jump Cut, no. 28, April 1983, pp. 51-58 copyright Jump Cut: A Review of Contemporary Media, 1983, 200. 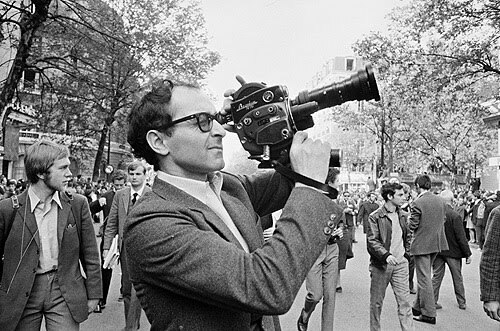 This is a great article on Godard’s movement from his Nouvelle Vague and more popular period of 1960-1968 to his more overtly political and less popular (but maybe more interesting) period of 1968-1973. Note: Julia Lesage was my thesis committee chair for my MA. >I was going to post this on May Day, but didn’t. This is an interesting interview with Evo Morales, president of Bolivia. He is the country’s first fully indigenous head of state in the 470 years since the Spanish Conquest.